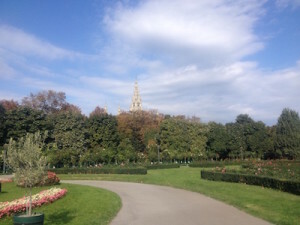 The Volksgarten (the People’s Garden) is located in the centre of Vienna’s first district, along the Ring Straße. Albeit not too big in size in comparison to other parks, you will find many people, especially those working in the area, coming here to relax during their breaks. The park itself has its own sights to offer. 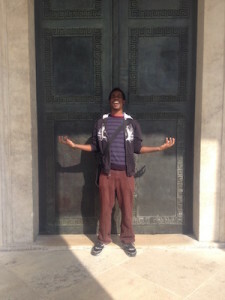 There is a beautiful rose garden and the Theseus temple. Built in the neoclassical style, the temple is modelled after the Temple of Hephaestus in Athens. Inside the temple you can find changing contemporary art exhibitions by the Kunsthistorisches Museum (Museum of Art History). There are also several monuments around the park, such as those of writer Franz Grillparzer and Empress Sissi. Bonus tip: The opening hours for the exhibition in the Theseus temple are from 11am – 6pm every day. 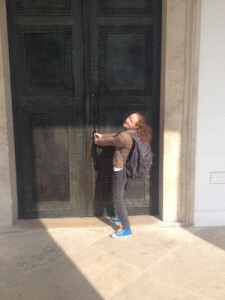 If you go there outside of those hours, you’ll find the doors to the temple locked like we did. Enjoying the view is best done during the warmer months, from spring till early autumn. You can sit anywhere in the grass or on one of the benches. If you don’t mind blades of grass sticking to your hair you can even lay down and watch the clouds trailing over the tops of Vienna’s most famous buildings. The reason why I call it lazy sightseeing is that from most places in the park all you have to do is turn in a circle and you catch a glimpse of the surrounding sights above the treetops. There you can spot the bright turquoise roofs, which you may recognize as the top of the parliament. To the right follows the gothic spiral tower of the Rathaus (City Hall). Further to the right the path leads to the exit on the side of the Burgtheater, the equivalent of the National Theatre. If you keep turning, depending on your location you can spot a dark brown tower, very simplistic looking, so that it almost looks out of place amongst the Neoclassical structures surrounding it. That’s the Minoritenkirche, a church from the 13th century. Once you see it the white building in front is the Hofburg, the former imperial palaces, which are now home to several sights and the president’s offices. 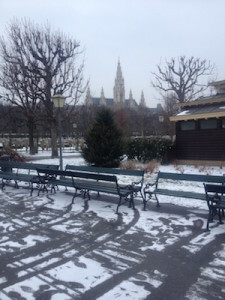 The Volksgarten is directly connected to the Heldenplatz, which is part of the Hofburg. If it’s a hot summer’s day, you can sit there in the grass and watch tourists past by. In the summer months there are also drinking water fountains there. The Heldenplatz itself has a very complex history, which we’ll write about in a separate article. During the winter months you very likely won’t want to sit in the grass or, depending on the weather, snow. The roses are usually wrapped up in burlap sacks to keep them from freezing, so expect the park to look like any other during winter. However, the view is even more detailed because more of the buildings are visible through the bare trees. The park also has a nice, quiet atmosphere, when it is sprinkled with snow like someone put powdered sugar on it, as we say in German. 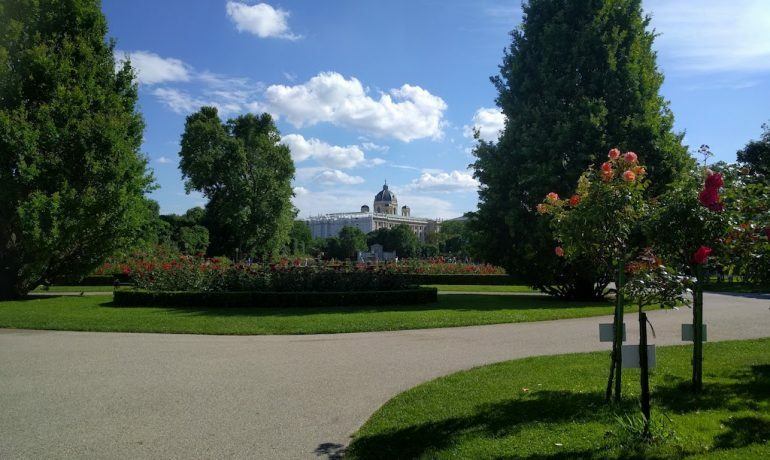 How to get there: You can enter the park from the side of the Burgtheater, from opposite the Parliament, through the Äußere Burgtor (also known as Heldentor) and directly through Helden Platz (via the Hofburg).